This Sunday our church participated in the Global Hymn Sing (https://www.globalhymnsing.com) sponsored by the Getty’s and focusing on world missions. As part of Global Missions Sunday we sang both the praise music version and the hymn version of the classic hymn, “Jesus Shall Reign,” by Isaac Watts. The number of Protestant foreign missionaries in the world grew from 100 missionaries in 1800 to over 21,000 missionaries by 1914. The portion of the world’s population that was Christian grew from 23 percent in 1800 to almost 35 percent in 1914. This rate of growth represented the fastest proportional growth of the church since its earliest centuries — and over a period in which world population grew more rapidly than ever before. The number of non-white Christians grew from 28 million in 1800 to 149 million in 1914. This meant that in 1914 the number of non-white Christians in the world was rapidly nearing the number of all Christians who were alive in 1800. The number of languages with Scripture increased from 67 languages in 1800 to 676 languages in 1914. For a great visual of this amazing growth, see the flash video map on the History of Religion. Missiologist Dr. Ralph Winter has died at age 84 after a long battle with cancer. Winter founded the U.S. Center for World Mission and revolutionized world missions in the late twentieth century with the concept of unreached people groups. Winter leaves behind his wife Barbara, four daughters, and fourteen grandchildren. Click here to read John Piper’s personal tribute to Winter. Therefore the church must be active in missions and evangelism. Our lives must be characterized by both the Great Commandment (Matthew 22:37-39) and the Great Commission (Matthew 28:18-20). As a pastor I will actively share the Good News of Jesus Christ with others, and I will encourage and equip other believers to do the same. I will encourage our church to be salt and light in the community in which we live so that others will be drawn to Christ by our message and example. I will also encourage the church to support missions around the world through prayer, financial support and personal involvement whenever possible. Jonathan Dodson explains how various cultures experience conversion differently and what that means for evangelism in the United States today. Gospel change in some cultures is more gradual than instantaneous. The American Evangelical tradition of “deep consciousness of personal sin followed by a sense of joyous liberation” is not common to all cultures. Missionaries labored for years before they saw a single conversion, and even then, the conversions were sometimes very different than what they expected. Cultures that are more communal experience conversion differently that cultures that are highly individualistic. In many African and Asian cultures, conversions come in pairs or families instead of by single individuals. Not all gospel change happens identically, especially across cultures. What these missionaries encountered “on the field” is beginning to occur in the U.S. Many church planters have a pre-Christian past that is very “Christian.” We inherited the evangelical, pietistic conversion experience of our forefathers. Like the conversions of our missionary forefathers, our personal conversion relied heavily upon a prevailing Christianized culture, common basic knowledge of God, sin, faith and Christ. But America has changed. We cannot assume our listeners possess the same knowledge and experience that we did, which is precisely why it is so crucial that we exercise pastoral wisdom through contextualization. What do you think? Although the gospel never changes, must we change our methods of evangelism in order to share Christ with those in a post-Christian culture? 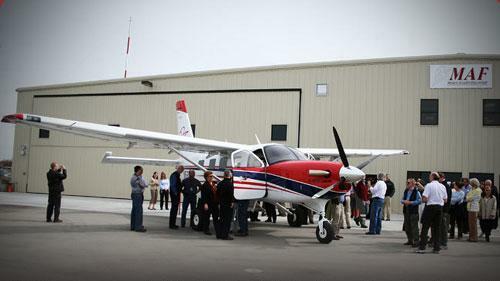 Mission Aviation Fellowship (MAF) recently received its first new plane specifically designed for missions. Manufacturer Quest Aircraft Co. of Sandpoint, Idaho delivered its first KODIAK 100, the first of the next-generation bush planes it produces, to MAF on Thursday. The plane is the long awaited result of the shared vision between MAF and Quest to design an aircraft that can run on jet fuel, which is cheaper than aviation gas (avgas) and in greater supply. Most of MAF’s fleet is Cessna 206’s (C206), which need avgas that is often in short supply and costly in areas where the mission group operates. Also, the KODIAK 100 can carry nearly twice the cargo – such as medicine, food or disaster relief supplies – of the C206 and will help MAF dramatically increase delivery while reducing operating costs. Profits from the commercial sales of the aircraft will subsidize a portion of the cost for each 11th plane produced. The 11th plane will be delivered to participating non-profit Christian and humanitarian aviation organizations. One hundred million children under the age of 15 live in the Arab world and at least half of them have access to satellite television. SAT-7 KIDS provides Christian programming for children in the Arab world 24 hours a day. SAT-7 KIDS is the first and only Arabic Christian channel exclusively for children. This channel aims to make the Gospel of Christ available to an entire generation of young Arabs in a way meaningful to them. The channel airs original dramas, talk shows, educational material, cartoons, music programs and other shows that capture the attention of young viewers. Don Carson is conducting a two-weekend seminar aimed at providing an overview of the Bible and the gospel message , especially for those not familiar with the Bible. Learning to evangelize men and women who know nothing about the Bible and who are bringing their own “baggage” or “context” with them does not require a super intellect or a Ph.D. in biblical theology. What it requires is learning to get across a lot of things that we Christians simply presuppose. There are quite a lot of ways of doing this. One of them is to focus on a variety of biblical texts drawn from across the entire Bible and work through them with people. One might begin with Genesis 1-2: “The God who makes everything.” Genesis 3 becomes “The God who does not wipe out rebels.” We keep working through the Old Testament and eventually arrive at the New, coming to topics like “The God who becomes a human being” (John 1:1-18). The wonderful atonement passage in Romans 3 covers “The God who declares the guilty just.” Gradually the Bible becomes a coherent book. It establishes its own framework; it is the context in which alone Jesus, the real Jesus, makes sense. Yesterday in church we viewed one of my all time favorite mission videos: The Taliabo Story. The Taliabo Story tells the story of how God used two New Tribes Mission families to bring the gospel to an unreached people group in Indonesia. Stephen & Mary Lonetti and Darryl & Kyla Palmer went to live with the Taliabo people in order to share Christ with them. After four years of learning the Taliabo language and culture, they began to share with them the “great story,” beginning with God and creation in Genesis. Working chronologically forward through the Old Testament, they taught them key concepts about God, man, sin, death, judgment, mercy, and grace. All of this was in preparation to teach them about Christ. After six months of teaching, they were finally ready to share with them about Christ’s death and resurrection. You will just have to watch the video to see what happened then! Click here for more Missions related posts.